In this week’s installment of our ongoing series bringing you the history of Princeton University and its faculty, students, and alumni, the Princetonian laments changes in New Jersey laws, Billy Graham addresses Christianity and the Civil Rights Movement on campus, and more. 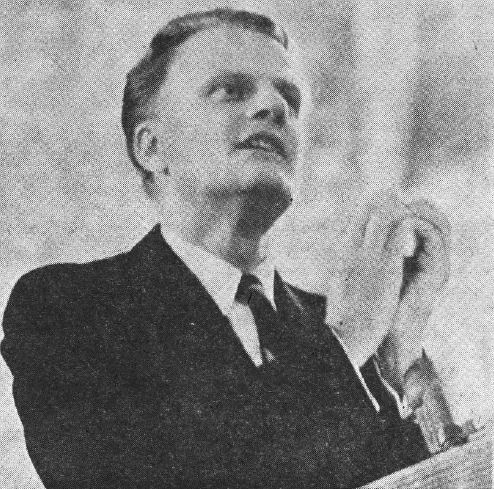 November 3, 1963—Well-known evangelist Billy Graham speaks twice on campus, once in the University Chapel and once in Alexander Hall. He asserts the Civil Rights Movement’s need for the church and speaks of his hope that Christianity will end racism in the American South. Billy Graham at Princeton, November 3, 1963. Photo from the Daily Princetonian. November 4, 1987—Princeton University architecture lab technician Leon Barth awakes to discover he has been elected as mayor of Roosevelt Borough, New Jersey, against his will. Residents of the town have ignored his repeated refusals to run for mayor and have campaigned for him anyway as a write in candidate. Though not wanting the job, he says he will submit to the will of his fellow townspeople and take it anyway. As the mayor of Roosevelt is an unpaid position, he will keep his day job at Princeton. November 6, 1869—The College of New Jersey (Princeton) and Rutgers College face off in the first intercollegiate game in the history of American football. This entry was posted in This Week in Princeton History and tagged Billiards, Billy Graham, Elections, Leon Barth, New Jersey by April C. Armstrong. Bookmark the permalink.